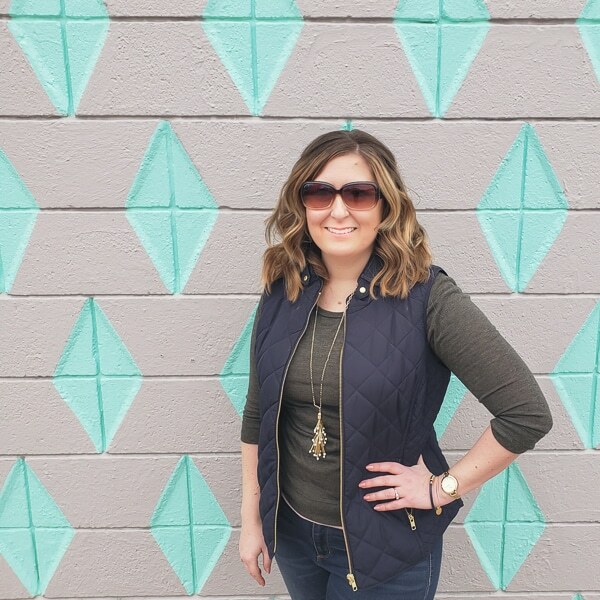 I’m so excited to be here from Restyle it Wright to share with you the ultimate decor challenge – re-creating a dream room for a fraction of the cost. When I think of dream spaces, Anthropologie often comes to mind. When their house and home catalog comes in the mail, I grab a cup of coffee and sink into the couch to slowly pour over every page ohhhh and ahhhhh’ing. Aside from the hefty price tag, I love everything about their house and home line. While their vibe is more bohemian glam, so many of their pieces are sure to fit into any niche. 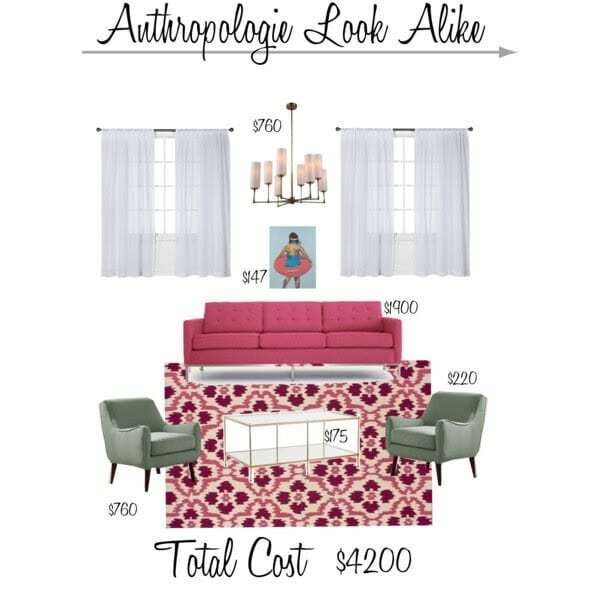 After perusing their new Spring 2017 House and Home Catalog I was determined to take an inspiration space from one of those pages and re-create the look for less. How much less you might ask? Well…stay tuned to find out! I started with this inspiration image from the catalog. Glam and Gorgeous right? A luxurious velvet sofa, warm metallic accents, and an unexpected pop of mint green work together beautifully to create a timeless space. 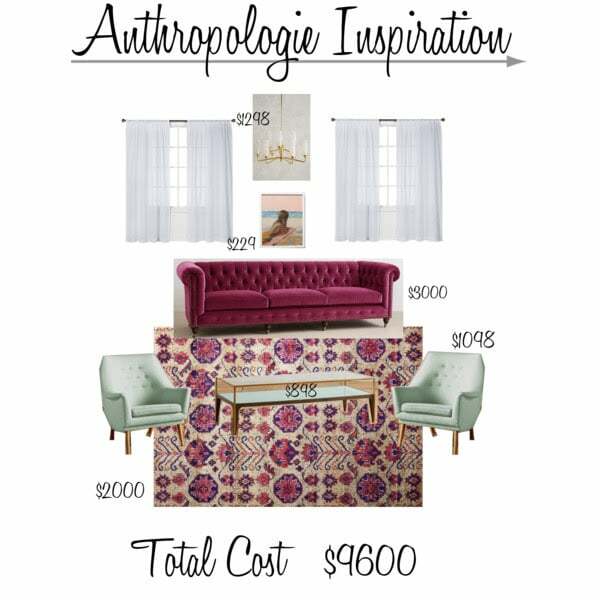 I picked some key elements from this inspiration and created a mood board to get an idea of cost. Let’s just say this room will set you back a pretty penny. Now, if budget were limitless, I may entertain the idea of buying everything I see…because it’s heavenly. BUT I live in reality and this $9600 on one room may be just a tad out of my price range. So let’s see if we can do better. I shopped online at some of my favorite budget-friendly places like Target, Home Depot, Joss and Main, and more to re-create this space for a third of the inspiration cost. I can’t wait to show you this! Prices in the image are BEFORE sales or coupon codes, so they’re the worse case scenario. I listed out today’s sales prices below. *We’re worried this rug isn’t going to last at this price, so we dug up some affordable alternates just in case. This one is the closest AND best deal. This one adds in some pops of blue and would be gorgeous. And you want a more modern flair, this one is perfection! 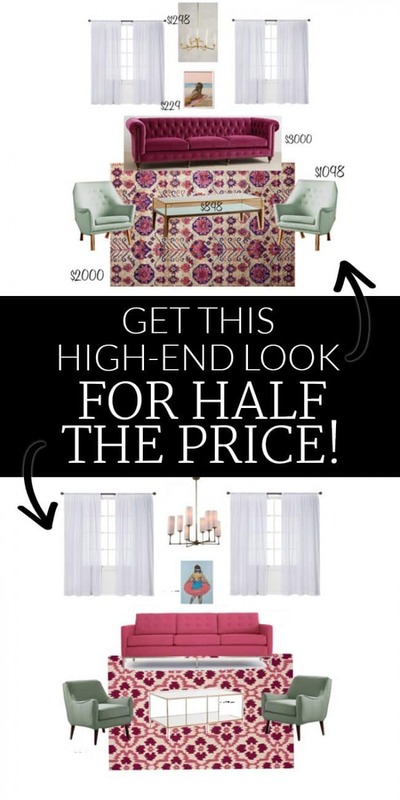 With current sale prices, you can get everything for $3000…1/3 of our inspo room! Holy Mama! Just think of all the fun we can have with that extra dough in our pocket. Trip to Disney? Mexico? Another room makeover? Be responsible and save it all? Well, maybe save some of it. But let’s be honest- there are always lamps, and rugs, and pretty things to buy. With some creative thinking, internet searching, and deal digging there’s always a way to bring your dream space to life without breaking the bank. 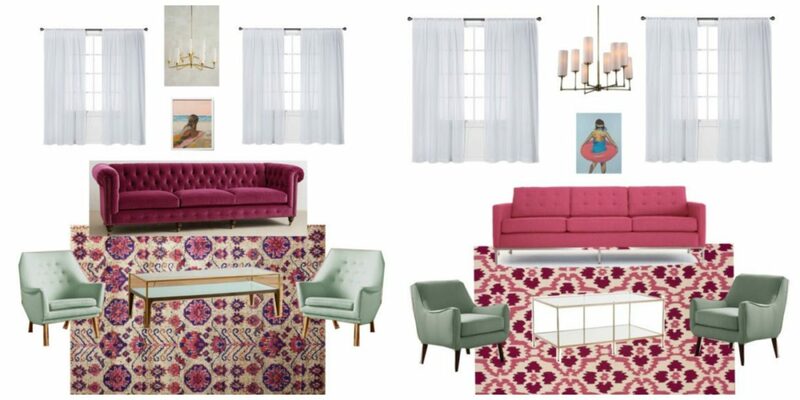 Wanna splurge on that pink velvet chesterfield sofa? Hey, thats okay too. 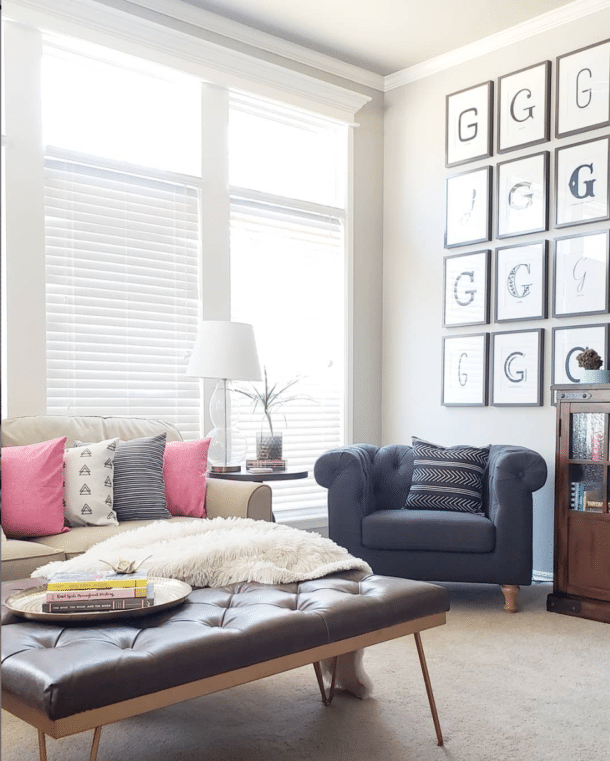 Creating your dream space is all about give and take and a combo of splurge and save. Well, this sure was fun friends! I’d love to hear how you create a space for less! But first one more look side-by-side. Maybe next you could do a bargain basement version of the same room? Hi Angela, Doing 3 versions would be fun next time! We’ll see what we can come up with. Thanks for the idea! An even more budget friendly version is a great idea! Thanks! 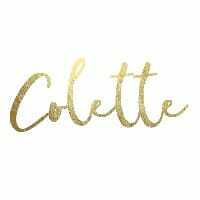 I love your budget-friendly look Colette!!! I can’t even believe the deal on that rug. I think I actually like the budget-friendly green chairs better than the Anthro ones! You’ve done some savvy shopping! The glam look is so sophisticated. I’m always interested in where you can find the same look and quality at a cheaper price. Thanks! Great Job! Right now I am in love with that yummy fuschia color. It looks wonderful paired with the green chairs. I agree! I can’t get enough of that color! Awesome job. Keep doing these comparisons, I like them. Love all the colors. Maybe consider doing a livingroom with a blue sofa. Thanks. I totally agree! I like quite a few of Colette’s find’s better than the originals – like that art and the mint chairs! I like the budget-friendly chairs even better than the originals. This is so fun! I love seeing the comparison and am all about saving money! Such a fun post!! 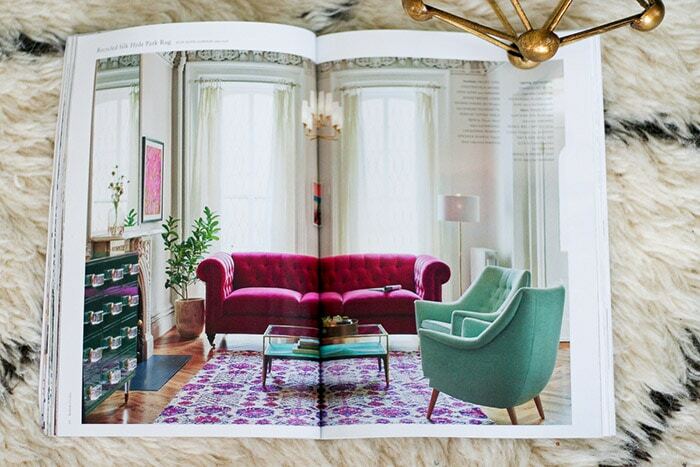 Love that look and I’m digging that pink sofa paired with the mint chairs…great finds, Colette! !